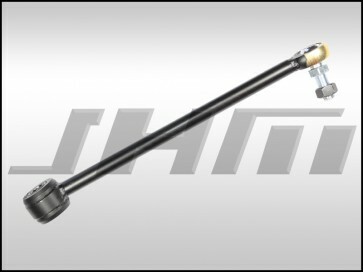 INTRODUCING THE ALL NEW, JHM HD LINKAGE CROSS ROD!!! This is NOT just a modified, OEM rod. 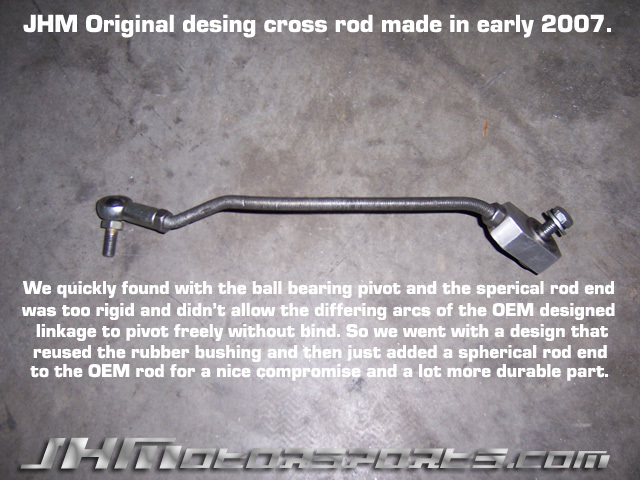 We have created a heavy duty, upgraded Cross Rod from scratch, built exactly to OEM measurements. Have you ever broken your delicate stock linkage cross rod and then called the dealer for a new one only to find they only sell it with the main rod for a ridiculous price? Are you looking to enhance the performance of your shifter setup? Or, do you already have the JHM Trio Package and are looking to enhance the feel just a bit more? JHM now has the solution with a brand new unit made from scratch with Heavy Duty, upgraded parts featuring a more durable design. We've taken our years of experience working on Audi transmissions and linkages and created a completely new, heavy duty, performance cross rod. We no longer modify the OEM unit, we build the ENTIRE cross rod from scratch. Using our in-house jig, we precisely build each unit to make sure it matches all the OEM angles. On the main shift rod end, we use a high-quality, spherical rod end with a bronze race for a more rigid side to side feel. It also increases the longevity and durability of the unit. On the selector shaft cap end, we upgrade from the stock rubber and plastic bushing to our heavy duty, graphite impregnated, polyurethane bushing. Can you say overkill? 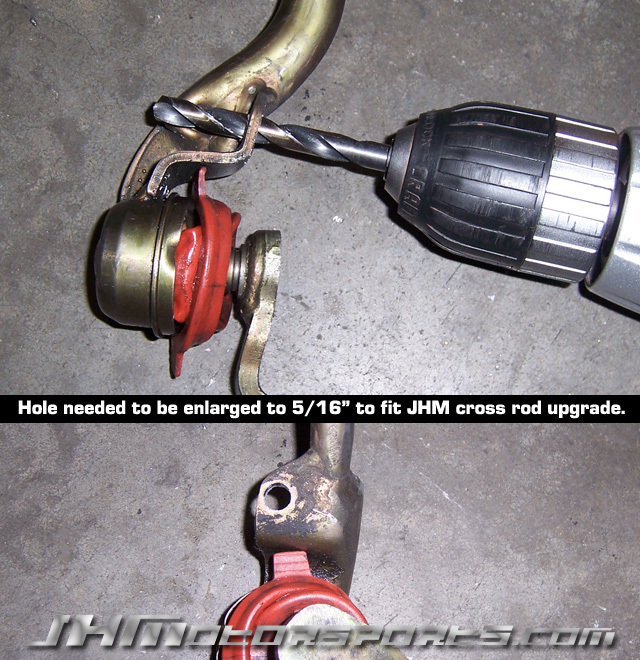 NOTE: The two pictures below show detailed pictures of a JHM HD Cross rod for another vehicle, not a 02X B6-B7 A4, your Cross rod will look like the unit above. 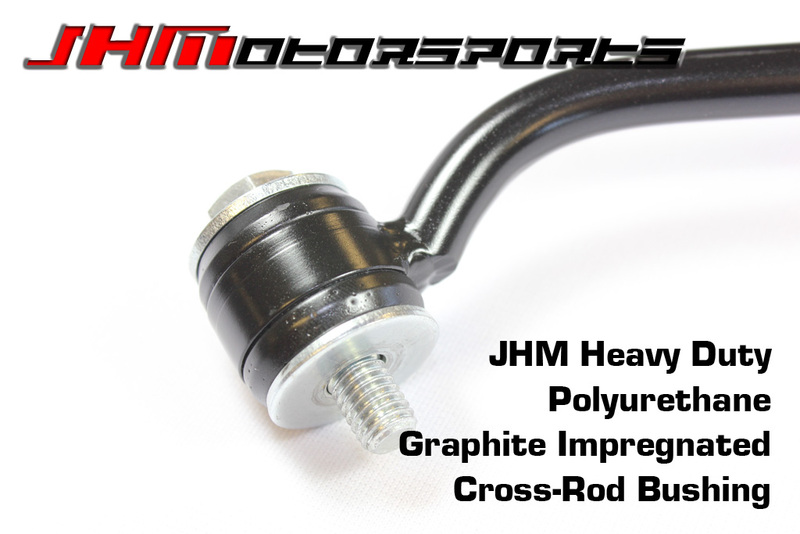 INCLUDES THE FOLLOWING - JHM HD Cross Rod with a spherical rod end and heavy duty, graphite impregnated polyurethane bushing. NOTE: We used to leave the stock rubber bushing on the selector shaft cap end OEM which would allow for the differing angles between the cross rod and linkage to work in concert. If we made this solid too the linkage would bind, trust us we tried it and it DID bind. Click HERE to see this original design. After spending time experimenting with different bushing materials, we were finally able to find a setup that was an upgrade over the stock setup while still allowing for the cross rod and linkage rod to have different angles. 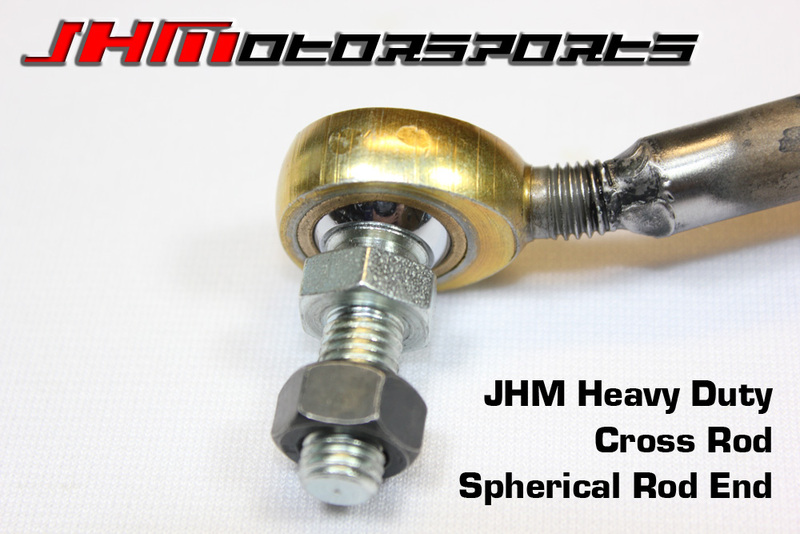 Just like with the old version, our new JHM HD Cross Rod COMES COMPLETE, AND READY TO BOLT ON WITH ONLY MINOR MODIFICATIONS!!! All you have to do is enlarge the hole in your stock main shift rod for the stock cross rod to 5/16". This will allow the JHM HD Cross Rod to bolt right on. Click HERE for a picture showing how this hole is enlarged. Core Charge: With our new, completely in-house built HD cross rod, THERE IS NO CORE CHARGE. Now you don't have to worry about sending your rod in ahead of time, dealing with a costly core charges upfront, or worrying if your rod will be eligible for a refund! You can simply purchase this whole new rod that has been built by JHM and we will send you one of the units we have built in-house!